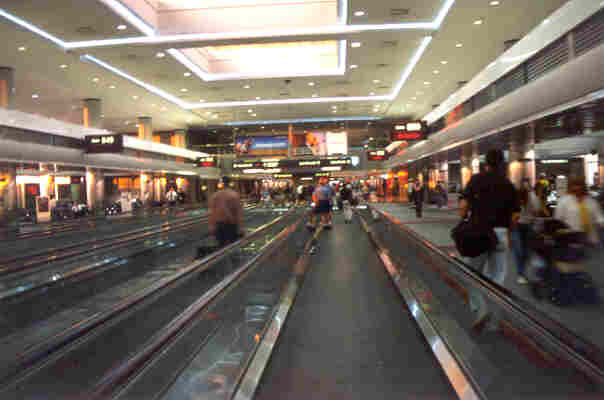 My second dinosaur adventure this summer began with three airflights starting at 5:00 a.m. Pacific Time and ending at 11:30 a.m. in Denver where I met Paul waiting for the third rental van. We got the van, got the students and Allison and Luke (my fellow teaching assistants) and got on the highway north from Denver for the eight hour ride to Zerbst Ranch. 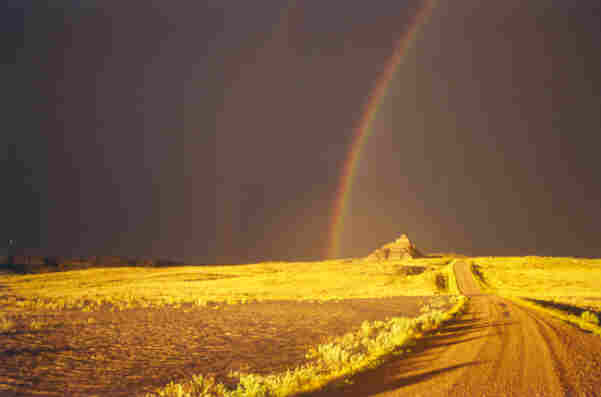 In between CDs, we listened to the radio weather forecast for Wyoming and since they were saying rain, I told Paul that the entrance road to the ranch might get "interesting" if it did rain. 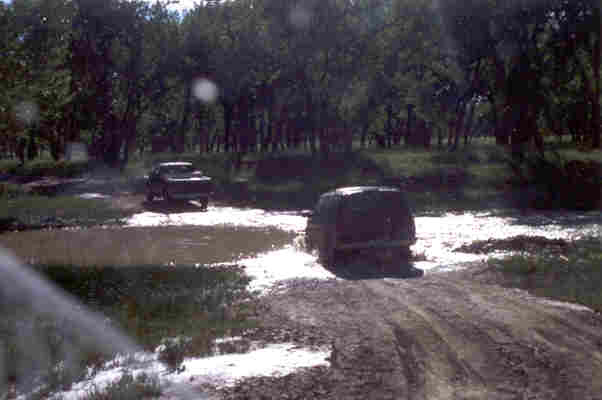 All was fine until we crossed the Cheyenne River which was only about 10 inches deep. But the road on the other side was moist mud. Our van was first. I have never driven a 15-man van sideways before. Paul and Allison hung back a bit to see if it was possible to follow. I kept sliding sideways, from one fish tail to the next - in the dark - scared to be scared and let the students know just how scared I was. I guess it was obvious; they all put aside their CD headsets and crossed their fingers. Chad must have seen our headlights coming, for he met us in a pickup truck and passed me. I heard he had to assist one of the other vans out of the mud. The only part where I was really frightened was coming down the last hill to the ranch. I apologized to the students, but had them get out and walk because I knew the hill was steep and next to a big gully. Coming down, the truck slid sideways and finally came to a stop with the rear tires only about 2 inches out of the ravine. Arlene was waiting for us with a warm supper. Boy did that dinner taste fine. We were all glad to be on a non-moving surface after nearly 10 hours in the vans. Everyone dropped off to sleep quickly that night - with dreams of fossils dancing in their brains. 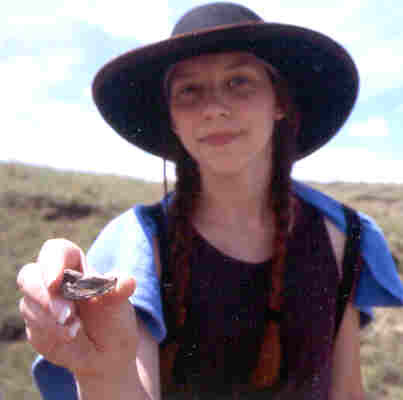 The next morning, Paul decided that the ranch roads were too wet to drive on, so we hopped in two vans, crossed the Cheyenne River (which was still only about 10 inches deep even though it had rained a lot over night), and headed for Hill City. We visited the Black Hills Institute, then drove south to Hot Springs where we had a guided tour of the Mammoth Site and returned to the ranch through one of the biggest thunderstorms I've ever seen. 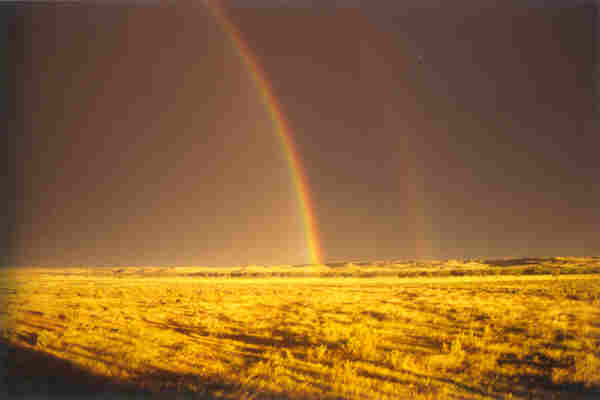 The left side of a double rainbow. But as we came down the county road, we could see that there was a lake where the road should be. Behind us, however, was a lovely double rainbow. There were also two gents in a pickup truck with Washington state plates, right in the middle of the road. The right side of a double rainbow. So we stopped and everyone got out and took lots of pictures of the rainbow while Paul waded out, decided there was still a road and decided to proceed. The men moved their pickup out of the way. The road disappears in the water. I wish I could show you the video of this crossing. Paul slowly approached the water and sprays of water went up like a fountain on each side of the truck. Then it was my turn. We picked up Chris who had shot video of Paul going through and slowly proceeded across. The pickup truck followed us. So far, so good. The road was covered by water one more time and then turned into slime. I was playing my CD of the Dalai Lama chanting "Om mane padme om." I found by chanting quietly with his holiness I was less stressed even though the truck was still going sideways. I explained to my passengers that, loosely translated, the phrase means "all is well in the world." I started chanting again; then heard, first one - then all the voices in the back of the truck chanting along! 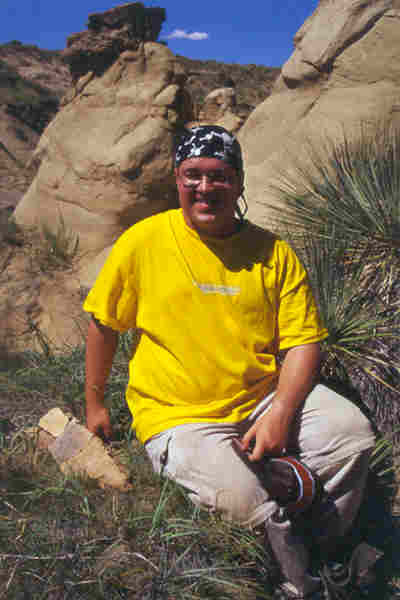 All was indeed well in our world, the Cheyenne crossing was easy and Chad had graded the mud on the other side down to a layer which was not wet, so we got back to Paleo Park quickly; had another welcome supper and slept. Paul looks at Gina's turtle. The next morning, bright and early, we all piled in two vans and went to the twin buttes which Gabe and I had prospected with Arlene in June. We divided into groups and spread out. Almost immediately, we started to find stuff. Gina found lots of pieces of a turtle. 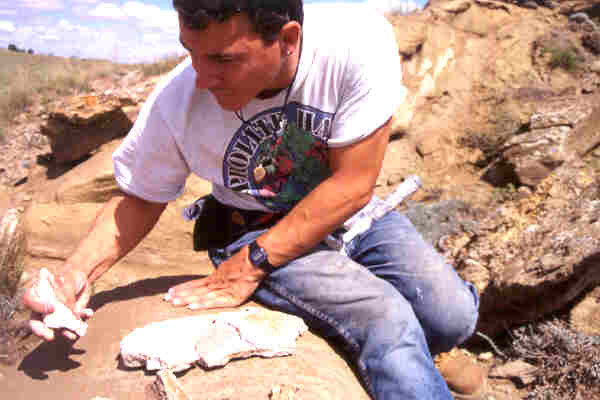 Here Paul is looking at the pieces of Gina's turtle laid out near where it was found. 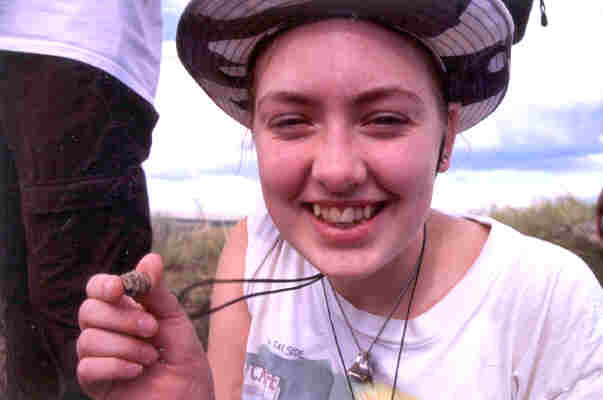 My group went to the other side of the road and we started working up that hillside of bone pictured in part one of this story and Sara found a Triceratops horn core sticking out of the hillside! It was truly amazing. Here we were, minutes into the first day, feet from the road - on ground that had been searched and searched for fifty years and she found the core just sticking out a little bit. But we were doing what we had been told to do: fan out, follow the bone upwards and see if you can find anything still in the ground. And so we did. As would be the pattern on the prospecting part of this trip, we met up with the other groups led by Paul, Allison and Andy and compared what we found. We all admired Gina's turtle and Paul wanted to see the horn core so everyone came back up the hill. It was then that I found something too. 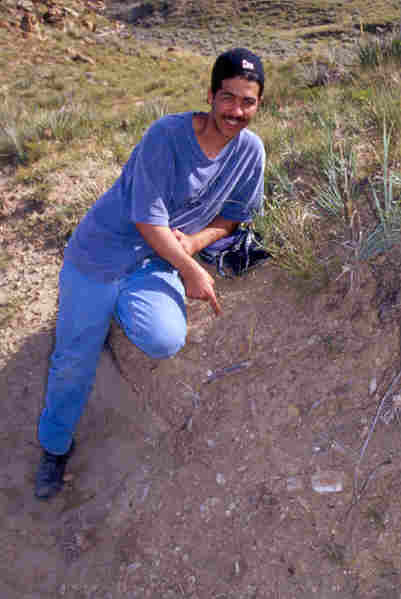 I found the tooth of Nanotyrannus in a little depression just slightly uphill and to the east of the horn core. It was with several other little fossils, separated from its owner - possibly during life as predatory dinosaurs got new teeth all through their lives. This was incredibly exciting to me. 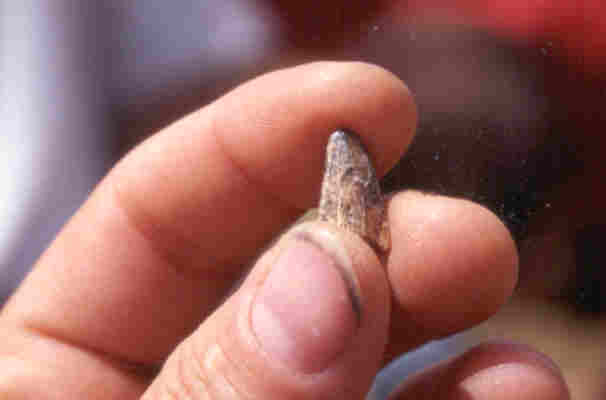 All my life I've been fascinated by tyannosaurs and to actually find a real tyrannosaur tooth on the first prospecting day seemed like an incredible beginning. I wondered what else we'd find. We had lunch and rotated the student groups to a different leader and went back out. My group went back up the same side of twin buttes, but further west. We passed some juniper trees and went over the top of the hill. We saw some rib bones imbedded in the soil at the top of the hill, then went down the wash. I don't know how he saw it, but Marco saw a toe bone in the wall of the wash. He started to brush it out and Carol started to shout "Oh my God! Look at this!" Carol found the tyrannosaur's claw. Carol was hopping up and down and waving from about 20 feet down the slope. I looked down, and she was right next to a claw - just laying there on the surface! 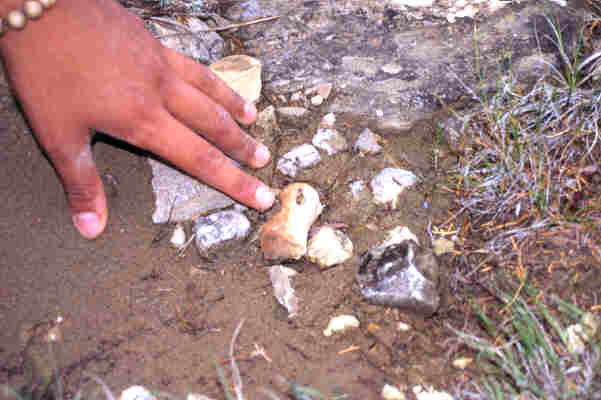 This is a picture of exactly how and where the claw was found. Check out Carol's big grin. Her fears of "not finding anything" evaporated right here, right now. We wrapped the claw up like a baby, scoured the area, found no more pieces of tyrannosaur and walked back to rejoin the others. We were late; and so we waited until everyone else had shown Paul their finds, then Carol took the claw out of Chris' pack and innocently asked, "Paul, do you know what this is from?" Paul has the usual prof. poker face, but this time he lost it. And everybody else got big wide eyes to see such a wonderful fossil. Allison said her group had heard Carol hollering from a quarter mile away! We went to a whole bunch of other spots that day and found many interesting things, but we lost Paul's camera which I had seen him set down near the horn core. So after taking the group back to Paleo Park for supper, Paul and I went out and retrieved his camera. We also stopped in the campground of the folks with the Washington plated pickup and chatted about their dig and their experiences in the Lance Formation over the years. 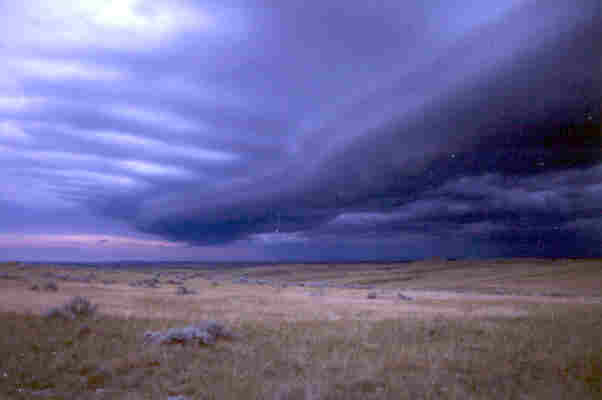 The clouds were getting ominous again, so we headed back to the ranch. The sheriff called Arlene and said there were tornado reports, but we didn't see any and we didn't have to stuff all 17 of us into Arlene's basement, either. It was a wild looking cloud. Every day was like this. We'd start early, drive out, divide into groups, fan out on the landscape and look for fossils. 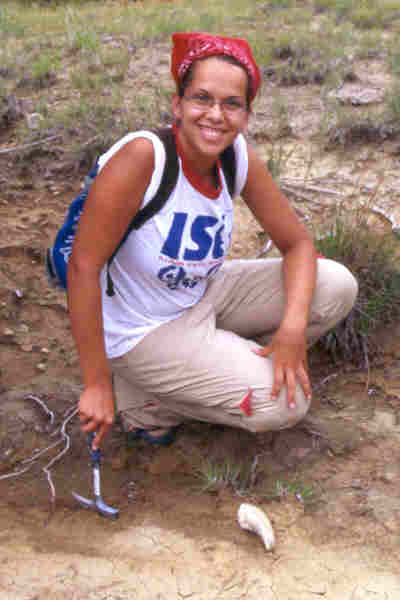 Any cool spots were recorded by taking a GPS point and perhaps surface collecting the specimen. We took notes and photos. We roasted in the hot sun. We picked up little pieces of contemporary dead critters, shotgun shells and shell casings, trash and sunburns. One group was in charge of burning their belly buttons. Another group always walked farthest out. Everybody found amazing things. From left to right above: Stephanie is pointing to a bone she found in the matrix. Dave found part of the jaw of a duckbill. This is the part that held the teeth groups. As duckbills lost their teeth, a new one would drop down these grooves into place. 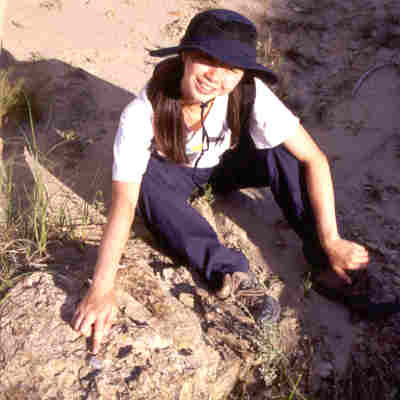 Gina found the tooth of a predatory dinosaur. To the left: Dinx found some huge bone, in pieces, laying on the edge of a slickrock dry waterfall and Tom is looking at the really cool piece of skull he found in a gully (right). On long trips like this, tensions can build up between group members. Arlene, Kris, Chad and Briley thought of a great way to let the tensions out. They prepared the yard for a water fight! We tried to get the students out of most of their clothes and shoes and to go outside for a "demonstration of Western culture." Once outside, Briley and Chad started spraying us down with water. No amount of persuading would get Paul into this; especially after the water fight turned into a mudfight! 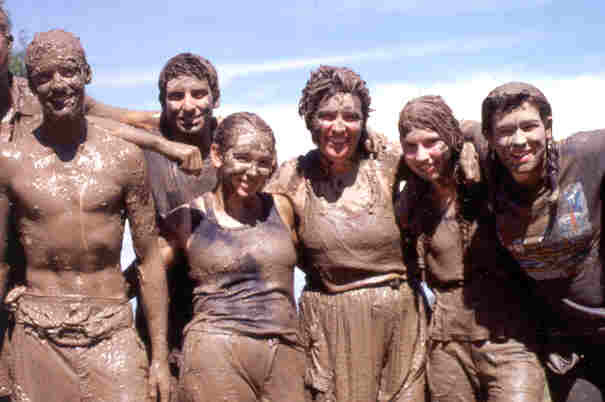 Of course, teaching assistants were prime targets for the mud. Here Luke tries to fight off all these pretty girls who are busily trying to coat him in mud. Marco and Andy got into another wrestling match; they'd been at it for days. Andy always won; this time he turned Marco completely muddy and then gave him a mud shampoo. Several of the belly button brigade were doused head first into buckets of water. By now everyone was a rather indistinguishable brown surrounding white teeth. All our tensions were evaporating and even the heat of the Wyoming day felt rather good. Luke is the first to get muddy. The rest of the class gets muddy. Meanwhile, Kris sat back and videotaped practically the whole thing. Arlene and Pippa took pictures while Briley and Chad kept refilling our buckets with water and laughing heartily at the antics. I was still clean at this point. I went in to talk to Paul for a minute and a chant of "Paul, Paul, Paul" started outside. He looked at me and said, "This is what teaching assistants are for... get out there!" Then he stood back and took pictures as I was coated in mud and dunked in a bucket. And here we are all covered in mud. 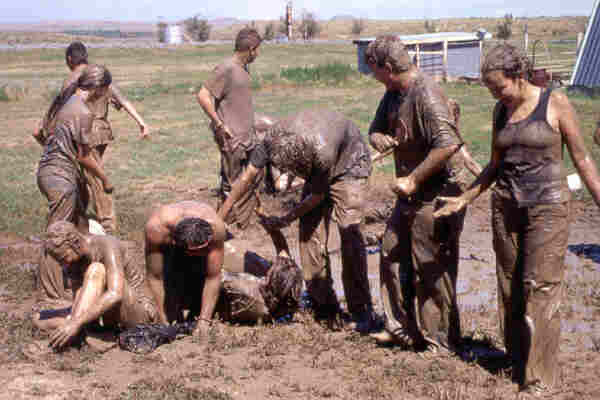 We formed the official order of the Wyoming mudpuppy that day. Then it was back in the field for more prospecting. When we got back to Paleo Park, we found that Arlene, Briley, Pippa and Kris had washed all our clothes clean of every molecule of that mud! From left to right: Chris, Jeremy, Rachel, me, Gina and Sara. Photo by Paul Sereno. 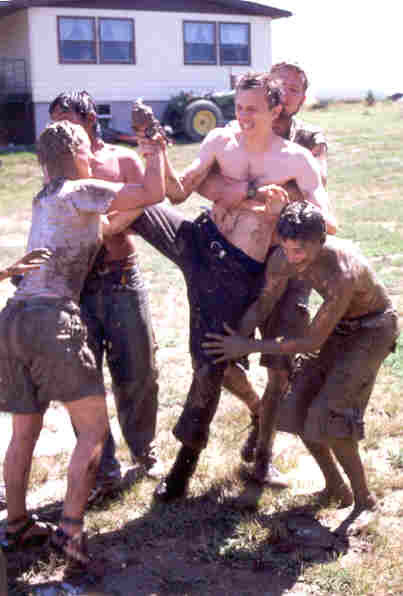 They also had made color laser prints of our whole group, titled "Paleo Park Water/Mud Fight 2001." And, that day, Arlene's newest souvenirs were delivered. She had a local woman embroider Triceratops and the Paleo Park logo on all different colors of shirts and had someone make casts of all the different types of teeth and claws found in the Park for necklaces. We were like shopping locusts. No one had been near a store in nearly a week because the Cheyenne was too high to cross and all this pent up shopping desire resulted in new shirts and jewelry for all of us - and some value-added profit for the Park! Later I was really glad that we had gotten our shirts first, because Gabe and her Advanced Paleo Class showed up and got all the rest of the shirts. 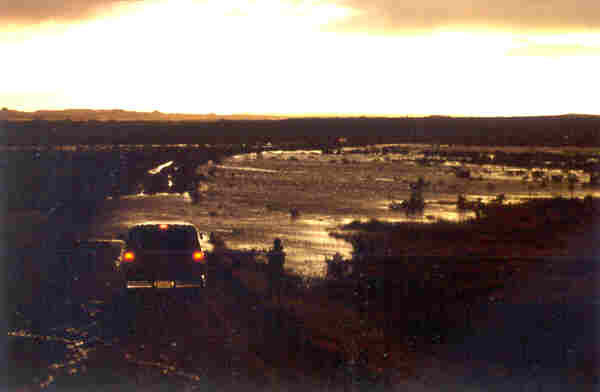 Arlene and Briley drive their trucks across the Cheyenne River. With the river crossing again passable, Paul sent me to Hot Springs to get the plaster he had ordered so that we could get the "rex blocks" ready to go back to the lab. Arlene and Briley were going out to Newcastle to pick up food and supplies, so they led the way through the Cheyenne and I followed. I got the plaster and some 2x4s and free wood from Hot Springs' trash dump and returned. Then Gabe and her Advanced Paleo Class arrived and a reporter from Associated Press joined us. 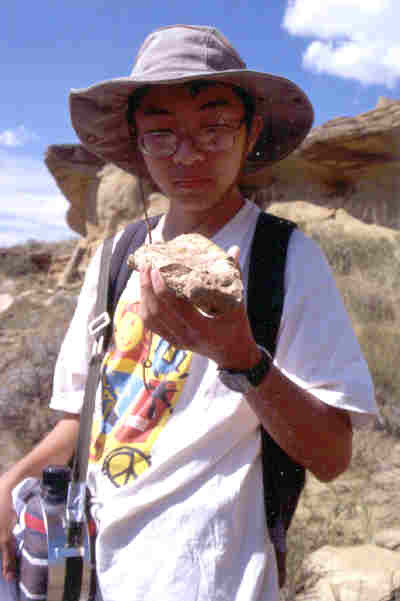 We took him on a quick hike to the hilltop nearest Paleo Park and Elena found a fossilized cone of a Cretaceous plant. It looked just like a cone from a modern redwood tree, but it was solid rock! Fossil cones are very rare and this was quite an important find. She gave it to Arlene for display at the Park. 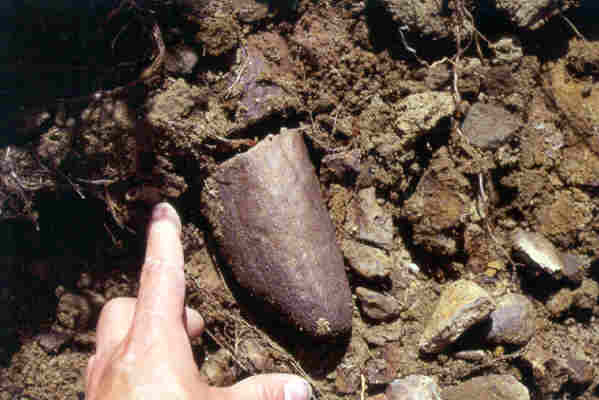 Elena found a fossil redwood cone. 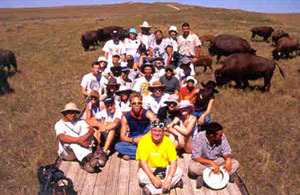 Both groups went to Stan Swanson's buffalo ranch. 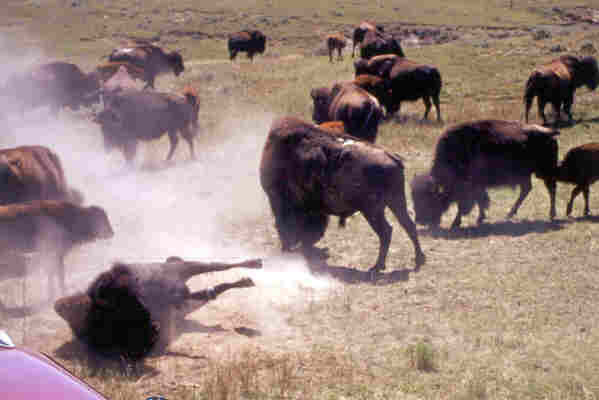 He showed us the chutes for handling buffalo, then took us all out in the field to see the critters. Some of the bulls were showing off and fighting. The cows have a dominance order, too. Surrounded by a herd of buffalo, you can understand why early settlers called them "prairie pigs," they sound just like swine. We were safely up on Stan's flatbed truck, so we could see and be seen, but we were not as close to the animals as Gabe, Kris and I had been in June. We then went to a lovely natural spring for lunch and prospected around a bit on his land. In the afternoon both groups went to a site near Swanson's dam. Some of the AP's were filmed by a Lusk paleontologist excavating a fossil, while others were assigned to our groups to prospect the area. Both groups pose on the flatbed. Towfiq joined Dinx, Dave, and Tom and we headed uphill to some "beautiful hoodoos" on the ridge top. It was so hot, we sat down in the shade, had some water and discussed what we'd like to find. Towfiq said he'd like to find "something significant" but expressed the usual fear that he wouldn't find anything at all. Everyone else urged him to be positive. Not five minutes later, Towfiq saw the edge of a bone poking out of the hillside! 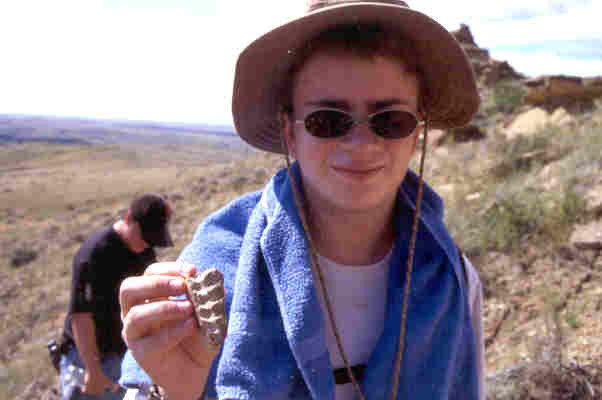 As with everyone who makes their first dinosaur find, he was so excited. He immediately credited visualization for at least part of his success. I had urged all the students to think about what they would most like to find and try to see the bone in their mind's eye. He had taken this to heart, but rather than ask for a particular fossil, he asked for and received a "significant find." The story continues on Page Three and began on Page One.